Here’s a fascinating website that takes no more than five minutes to take in. Swing A Cat is run by Sunderland Housing Group and it shows the fruits of some research into how we live and how much space we have in and around our homes. 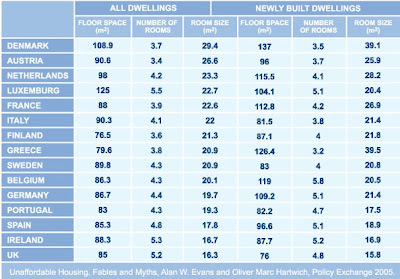 Prominent is the table, shown here, which demonstrates that we in the UK have the smallest homes in Europe. And our new homes are getting smaller still, whereas in most other countries they are growing larger. The next time you read some Europhobic attack in the Daily Mail or Telegraph on how Brussels is always interfering in the British way of life, to the detriment of all our core values, etc, etc, just bear this in mind. Of the 15 European countries shown here, only England & Wales have no minimum space standards for housing. The result speaks for itself. Notwithstanding our perceived lack of space standards, I understand that Local Authority EHO sometimes invoke the Housing Act, 1957, Sixth Schedule, Table II, for minimum room sizes for nursery, single and double bedrooms. I expect many National Builders and Estate Agents contravene this Act which I believe is still in force.